Our beautiful state of Florida has many lovable qualities: endless sunshine, perfect beaches, vibrant wildlife, friendly communities, and thrilling entertainment, just to name a few. However, the state of Florida is also known for something a little less appealing to residents and visitors alike: sinkholes. While sinkholes can occur all around the world, the most damage from sinkholes in the United States usually happens in Alabama, Florida, Kentucky, Missouri, Pennsylvania, and Tennessee, but the most recorded sinkholes in the country have happened in Florida. Due to the natural features of Florida’s terrain,Florida is an ideal location for sinkholes. Sinkholes are depressions or holes in the ground caused naturally by the collapse ofthe surface layers, and these surface layers can collapse as the result of a variety of events. Sinkholes form naturally when soluble bedrock such as limestone is removed gradually through the process of erosion instigated by moving water. Sinkholes can also develop when a cave roof crumbles, the water table lowers, or groundwater dissolves the rock below the land surface and carries away loose particles so that a void appears. Sinkholes can even happen in dry conditions because the lack of rainfall or an excess of rainfall in a short period of time can disrupt the earth so as to cause openings. Human activity can also incite the creation of sinkholes. In urban areas, water mains breaking, old pipes bursting, sewers slumping, and water-drainage patterns changing can lead to sinkholes, and these sinkholes can sometimes occur to the detriment of the surrounding neighborhoods. Solution sinkholes: These sinkholes form slowly when the bedrock of limestone is exposed at the surface by a lack of vegetation or soil and endures dissolution, which means that rainwater saturates the ground and creates a depression through the erosion of the bedrock. Cover-subsidence sinkholes: These sinkholes also form slowly in areas where sand on top of the bedrock slides down into openings in the bedrock and lowers the land surface. The size of the depression grows as erosion continues. Cover-collapse: These sinkholes involve bedrock covered by clay at its top layer and dissolved into an underground cave by water beneath its bottom layers. These bottom layers of sediment erode over time to increase the size of the cavern until only a thin layer remains between the underground opening and the surface of the ground. This type of sinkhole forms rapidly when that thin layer falls in and opens up a sinkhole that swallows everything above it. 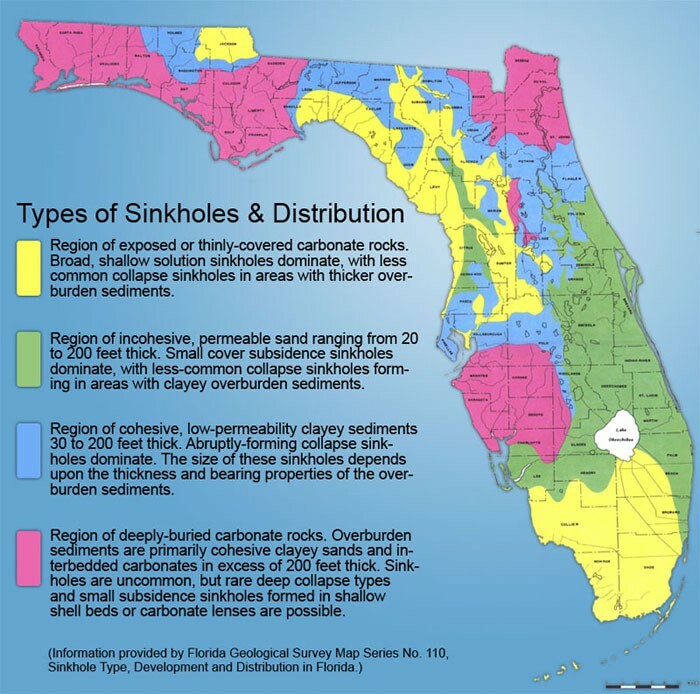 Florida’s blooming population and unpredictable rainfall make sinkholes an even greater concern in our state, and that is why it is very important to understand and be able to detect the signs of sinkholes in your area. With compaction grouting, Solid Foundations is able to stabilize the soil under your home and fill in sinkholes that may have formed. By adding a thick mixture of cement and grout deep into the soil with the use of a limited access drill, we are able to increase the load the soil can bear. This mixture permeates the voids in the soil to maximize the density, fills the hole to erase the damage, and seals the top of the limestone layer to steel it against future complications. 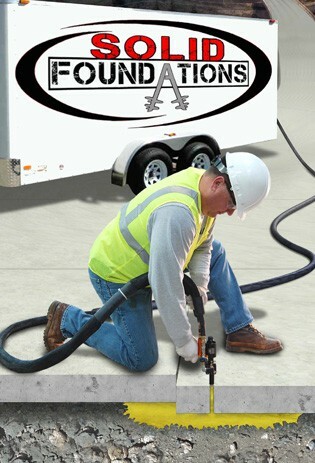 Solid Foundations employs void filling to lift and repair the concrete slabs on your property that could be or have been affected by a sinkhole. The process of void filling pushes a high strength structural polyurethane foam beneath concrete slabs or behind below grade concrete structures through the use of a pump. This polyurethane material floods any empty spaces and steadies the concrete against any outside forces. With void filling, Solid Foundations can cover a large area in a small amount of time and with minimal disruption and leave all of the soil below the concrete extremely dense and sturdy. With our tried and tested sinkhole repair tools and techniques, Solid Foundations can recover the safety and security of your property. Though Florida is a great state to live in, it is also the state that is the most susceptible to sinkholes, and such sinkholes can be very dangerous and devastating. Sinkholes have the habit of swallowing buildings, closing roads, and inflicting significant amounts of structural damage, so they are not to be taken lightly. Sinkholes are disturbing, but with Solid Foundations, you have nothing to fear. We understand your sinkhole concerns, and we want to protect your family and your property as much as you do. Therefore, Solid Foundations supplies the expert sinkhole remediation services and the caring customer service that can resolve your sinkhole struggles and restore your peace of mind. Our goal is to put you back on solid ground in the aftermath of a sinkhole, so call Solid Foundations today to receive the most successful and valuable sinkhole remediation services in Florida.